vSISTER MARIBETH continued from page 9 real people too, people who played cards, prayed together, ate together, and shared their lives together. “They were joyful, just joyful!” While feeling a constant pull towards the monastery, Sister Maribeth was also often uncertain. She remembers a pivotal moment after leaving a retreat where she literally had one foot in the door entering a campus building towards her dorm, and the other outside, between the monastery and the college. She mentally vacillated and appealed to God, “If this is what I’m supposed to be doing please give me a sign.” One sign came soon after, during her sophomore year. She was engaged in a guided meditation of sorts, as a part of a campus ministry activity. The participants were to imagine themselves climbing up a mountain and that Jesus was with them. Sister Maribeth recalled how she actually felt like she was struggling to get up that mountain I madeyistelf! m Knitting and crocheting is fun and relaxing. 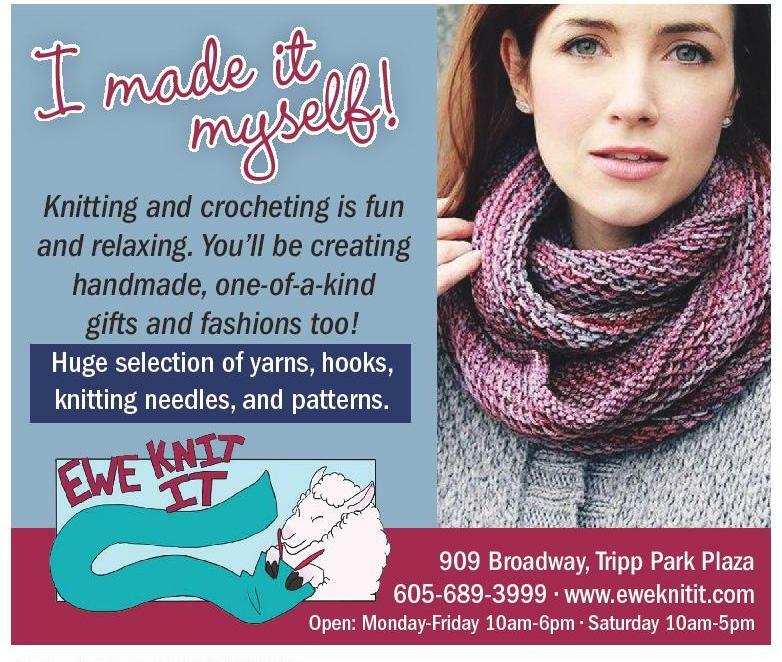 You’ll be creating handmade, one-of-a-kind gifts and fashions too! Huge selection of yarns, hooks, knitting needles, and patterns. towards the end, and that Jesus took her hand and helped her succeed in making it to the top. Once there she implored him, “Jesus, what am I supposed to do with my life?” His answer was inequivicable, “I want you to do my work here on Earth and follow me.” She understood clearly what he meant. Sister Maribeth tried being exceptionally busy in her junior year to focus on campus life and participating in numerous activities thinking it would prevent her from having time to get seriously involved with the monastery, but in her downtime and even in quiet moments while studying, she would still find herself thinking about the monastery. In her junior year she made her final decision. In August 1987, her junior year in college, she became a postulant and lived at the monastery while completing college and doing her student teaching in English at Yankton High School. Her cooperating teacher was Donna Fisher, whom she credits for being an inspiration for excellent teaching. “She was amazing, she just loved the students, and showed me how it was more than just about showing up and doing your job. It was about loving the people you were working with too.” Soon after graduating she became a novice and started working in Sioux Falls at O’Gorman High School teaching English and being campus minister from 1990-1996. It was during her tenure where one of her many fun side activities, was being included in the C.L.O.W.N. ministry: Children Learn Other Ways Naturally, which involved working with children and teaching them about the perils of drugs. It was on her birthday, January 16th, 1990 that she made her first vows. 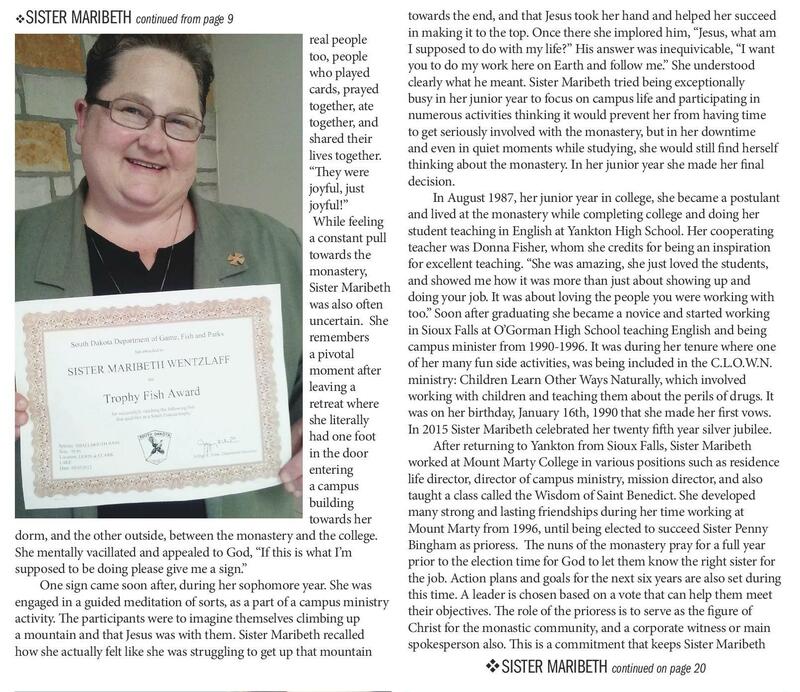 In 2015 Sister Maribeth celebrated her twenty fifth year silver jubilee. After returning to Yankton from Sioux Falls, Sister Maribeth worked at Mount Marty College in various positions such as residence life director, director of campus ministry, mission director, and also taught a class called the Wisdom of Saint Benedict. She developed many strong and lasting friendships during her time working at Mount Marty from 1996, until being elected to succeed Sister Penny Bingham as prioress. The nuns of the monastery pray for a full year prior to the election time for God to let them know the right sister for the job. Action plans and goals for the next six years are also set during this time. A leader is chosen based on a vote that can help them meet their objectives. The role of the prioress is to serve as the figure of Christ for the monastic community, and a corporate witness or main spokesperson also. This is a commitment that keeps Sister Maribeth vSISTER MARIBETH continued on page 20 IT’S UP TO YOU. BUT, YOU’RE NOT ALONE. While 51% of the nation’s wealth is held by women, close to half are worried about outliving their wealth. Taking control of your finances can help you feel better, and we can get you started with a plan. 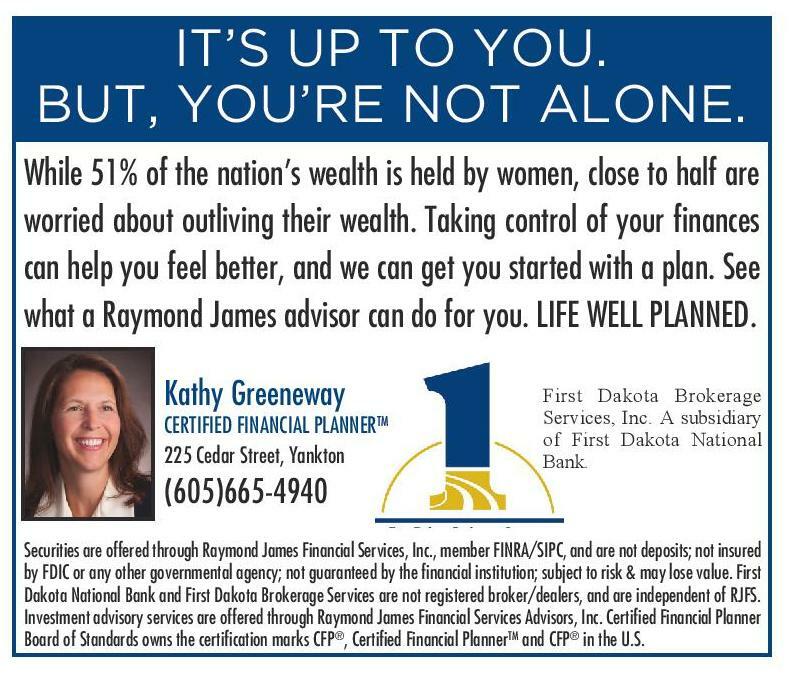 See what a Raymond James advisor can do for you. LIFE WELL PLANNED. Kathy Greeneway CERTIFIED FINANCIAL PLANNERTM 225 Cedar Street, Yankton (605)665-4940 909 Broadway, Tripp Park Plaza 605-689-3999 • www.eweknitit.com Open: Monday-Friday 10am-6pm • Saturday 10am-5pm 18vHERVOICEvJULY/AUGUST 2018 First Dakota Brokerage Services, Inc. A subsidiary of First Dakota National Bank. Securities are offered through Raymond James Financial Services, Inc., member FINRA/SIPC, and are not deposits; not insured by FDIC or any other governmental agency; not guaranteed by the financial institution; subject to risk & may lose value. First Dakota National Bank and First Dakota Brokerage Services are not registered broker/dealers, and are independent of RJFS. Investment advisory services are offered through Raymond James Financial Services Advisors, Inc. Certified Financial Planner Board of Standards owns the certification marks CFP®, Certified Financial PlannerTM and CFP® in the U.S.